GoFormz Workflow Automation provides a way to automatically upload PDF versions of your forms to your Box account based on various triggers, such as when a form is completed. Many organizations use Box as the enterprise storage and collaboration solution for all their documents across all departments -- whereas GoFormz is typically only used by a subset of an organization. The ability to automatically upload your forms to Box lets you store all your completed forms in one central repository (your Box account) and also allows your coworkers who do not have GoFormz accounts to view these forms. Note: before you can set up your Box upload workflow, you must activate the GoFormz-Box integration by connecting your GoFormz account to your Box account -- otherwise GoFormz won’t know which Box account to upload your forms to! See here for instructions on activating the Box integration. To set up automatic form uploads for Box, do the following. See here for more on automated workflows in general. 1. Navigate to the Templates Tab and click the form template for which you want to set up automatic Box uploads. The Template Editor will launch. 5. Select Save to Box from the dropdown under Do the following. 6. Click the Select button next to the Root folder field, and choose the Box folder that will be at the root of your folder hierarchy for this template. In this example, the root folder is “Work Orders”. 7. Next, specify the Destination folder, which is the subfolder where your forms should be saved. If this field is left blank, your forms will be saved directly in the root folder. This field supports GoFormz variables, which is very powerful because it allows you to use form responses to drive the name of the folder where your forms are stored. In the example below, the destination folder is the customer’s name, as specified in the form’s [Customer Name] field. Click the Create if not found checkbox** if you want GoFormz to create a new Box folder if a folder with the specified name does not already exist; if the box is not checked and the folder does not exist, then the form will be saved in the root folder. **Note: It takes several minutes for the Box API to pick up a newly created folder. During those few minutes, upload attempts to the new folder will fail. Be aware of this when using the “Create if not found” functionality. For instance, in this example, suppose “Company1” is a first-time customer, with no folder configured in Box. With the above setup, when you complete a form with this customer name, it will create the “Company1” folder in Box, and upload the form. However, if you try to upload another form within several minutes of the first, that upload will fail. 8. In the Pages to Include in PDF dropdown, select which form pages should appear in the PDF that is uploaded to Box. The default “All pages” option will upload a PDF of the entire form. Additional options must be set up using the template’s Print Configs option. 9. If you want someone to be notified if the Box workflow fails for any reason, specify those emails in the Error Notification Email Address area. You can include multiple comma-separated email addresses, and GoFormz variables are supported here. In the example below, the error notification is sent to the owner of the form that failed to upload to Box, as well as to johnq@goformz.com. 10. Metadata makes it easier to organize, sort, and filter your forms in Box. If you want Box to associate some metadata with your uploaded form PDF, there are two ways to do this -- Metadata Template or Custom Attributes. Metadata Template. 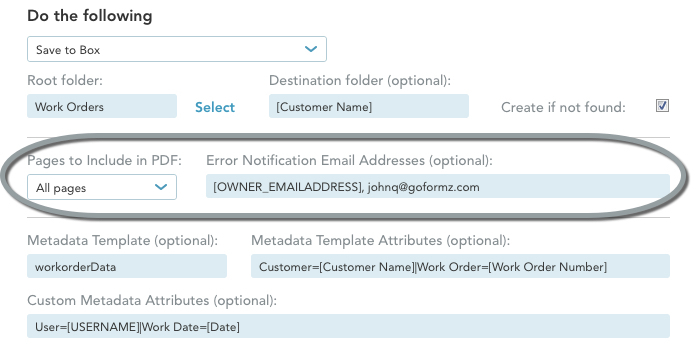 In the Metadata Template field, enter the name of a metadata template that you created in Box. Then in the Metadata Template Attributes area, enter your Box metadata attributes along with the GoFormz variables that should provide the data for those attributes. The syntax for entering this information is fairly simple. In the example below, we use the “workorderData” template, and we assign the contents of the [Customer Name] and [Work Order Number] form fields to the “Customer” and “Work Order” metadata attributes, respectively. Custom Attributes. 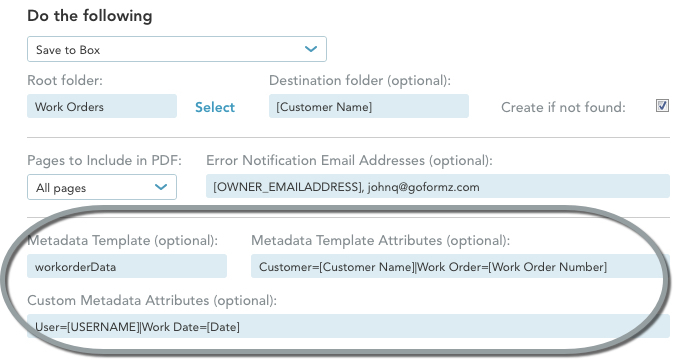 In the Custom Metadata Attributes field, enter the desired Box metadata attributes along with the GoFormz variables that should provide the data for those attributes. The syntax is the same as for Metadata Template Attributes. In the example below, we assign the name of the user who completed the form ([USERNAME]) and the contents of the form’s [Date] field to the “User” and “Work Date” metadata attributes, respectively. 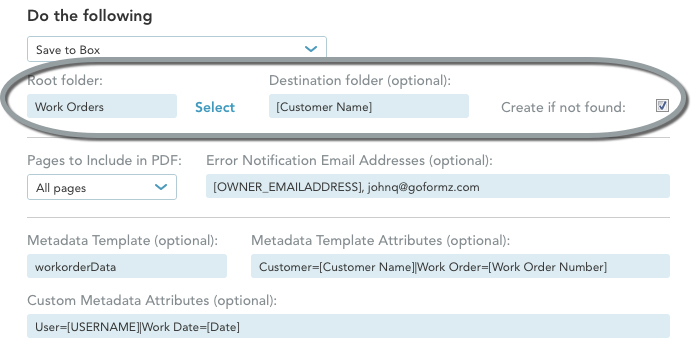 See here for more detailed instructions on integrating GoFormz templates with Box metadata, including how to set up Box metadata templates, how to make your form fields compatible with them, further discussion of syntax, and examples. 11. Click the Save Changes button at the bottom to finish setting up the Box upload.